VANKLEEK HILL, ON – A new off-shoot of Beau’s All Natural Brewing dedicated to mixed fermentation and barrel-aged beers has announced the details of its first release. 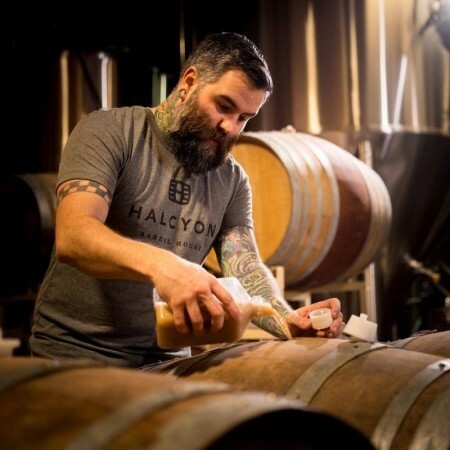 Halcyon Barrel House is being spearheaded by Bryce McBain (pictured above), who has been a brewer at Beau’s since 2011. It is made with barley malts, oats and wheat, and features Amarillo, Nelson Sauvin and Citra hops. It was fermented with brewer’s yeast as well as multiple strains of brettanomyces (a.k.a. brett, a wild yeast), and is a blend of batches aged 1-3 months in red wine barrels. It pours a hazy orange-gold with a lively head of foam. Tropical fruit aromas with hints of citrus and brett-influenced funk are at play, along with a touch of wine. Flavours are of ripe fruit, funk and red wine, with playful carbonation, restrained IPA bitterness, and a dry finish. Infinity Mirror will be launched on May 25th and will be available in 750 ml bottles at the Beau’s retail store and LCBO locations, and on draught at select bars and restaurants in Ontario and Quebec. Limited distribution in other provinces will follow in coming months. Halcyon’s second core brand, a 9% abv sour ale called Gravity Well, will be launched this autumn. In the meantime, a number of limited edition releases are planned for the summer. For more details, see the Halcyon Barrel House website.